Click Here to receive a free downloadable copy of this document via email. What did Dr. Maria Montessori discover about how children learn? 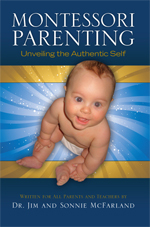  How do you view the authentic nature of the child?  How do the following aspects of Mind affect children’s learning and development?  How do the following aspects of Spirit affect children’s learning and development?  Discuss The V.E.I.L. Model and how it assists our understanding of the child in the process of “Unveiling the Authentic Self”.  Volition Phase: What are the four elements embedded within the child that naturally motivate him toward self-actualization and fulfillment? Discuss each element more fully.  Engagement Phase: What are the four elements embedded within the child that allow him to receive environmental stimuli and meaningfully engage in the environment? Discuss each element more fully.  Integration Phase: What are the four elements embedded within the child that support the child’s ability to assimilate and process information that is received from the environment. Discuss each element more fully.  Love Phase: What are the four elements embedded within the child that call forth joy, satisfaction of completion and a desire to continue to learn more and begin the Unveiling Cycle all over again. Discuss each element more fully.  Physical Environment: What are you doing with the physical environment that works well for you and your children? What new ideas did you get that might further improve the physical environment in your home? How will that help you and your child?  Mental Environment: What aspects of the mental environment in your home work well? Why? What aspect of the mental environment in your home could you improve? How will that help you and your child?  Emotional Environment: What activities do you do as a family to foster a positive emotional climate in your home? How do you handle emotional challenges in your home? How might you improve in this area?  Spiritual Environment: What is the key to enhancing the spiritual environment in your home? How do you express love in your family? What might you do to enhance the feelings of love and cooperation in your home?  Discuss the Holistic Model of Body – Mind – Emotions – Spirit and their interrelationship to one another. In other words: How does negative thinking with your Mind impact your Body, Emotions and ability to connect to your Authentic Self or Spirit?  Body: When your Body is unbalanced (hungry, tired, sick, etc) how does that affect how your Mind thinks, how your Emotions feel, and how you experience your Spirit or Authentic Self? When you are unbalanced physically, how might this impact your behavior with your family? What have you found to be helpful when your Body is unbalanced? What are some additional ideas you might use? Why is deep breathing important? Practice deep breathing!  Mind: Mind can be a great support to us and it can also be a great challenge for us. Which aspects of our Mind are responsible for our scattered or negative thinking? (Sensory-Motor, Ego, Memory Bank) What happens to our Body, Emotions and Spirit when our Mind is scattered or thinking negatively? Which aspect of our Mind can we rely on to help us make wise and thoughtful decisions? (Inner Guide) How does deep breathing calm our Mind?  Spirit: What do you do to nurture your Spirit or Authentic Self? What are ways in which you can affirm yourself and let go false self-images or paradigms about who you really are? Why is it important to affirm our Authentic Self and do our best to stay connected to it by harmonizing our Body, Mind and Emotions?  Why is it important to establish nurturing relationships with our children? Discuss how the following three qualities help to establish nurturing relationships.  Discuss the differences between being a “Good” Parent as opposed to a “Responsible” Parent. What are some of the subconscious thoughts that lead us to act from the perspective of a “Good” Parent? What are some of the subconscious thoughts that lead us to act as a “Responsible” Parent?  Why is “compassion” an important component of communication? Where does compassion originate? What are some of the ways that we can communicate non-verbally that we respect the child and want to hear what he/she has to say?  What types of statements automatically block compassionate communication with our children? How do these statements harm the child and affect our relationship? What are the root causes of these blocking statements? How can we learn to avoid using these harmful statements?  Discuss the difference between a “You” Message and an “I” Message. What is the consequence when we use a “You” Message? What is the consequence when we use an “I” Message? When is it appropriate to use an “I” Message to express ourselves?  What are common Roadblocks to Listening? Why are these responses harmful? What is a compassionate way of listening to our children to keep their heart open and communication flowing? What is the ultimate purpose of Empathetic Listening? If you have a problem with your child, what do you do? If your child comes to you with a problem, what do you do? If you both have a problem with each other, or if two children have a problem with one another, what do you do? Discuss the process of Conflict Resolution and, if possible, “role play” a scenario where two children have a problem and there is a mediator to guide the conflict resolution.  Discuss how children’s engagement in meaningful work facilitates the development of inner discipline. Why is it important to respect a child’s concentration if at all possible? If you must interrupt thoughtful work, how can you do it in a respectful manner? Discuss various ways to model and reinforce children’s positive, thoughtful behavior. What are the consequences if we primarily “see” and point out what our children are doing wrong?  Discuss why the offering of Rewards can actually thwart the child’s natural inclination to contribute to the family. What are the possible consequences when children come to expect rewards for positive behavior? What is the subtle difference between giving praise to a child for thoughtful work and acknowledging the thoughtful work?  Discuss the necessity of establishing and reinforcing healthy boundaries. Why are boundaries for children important? Share thoughts of how one might establish ground rules (boundaries) in the home so that all the family members are involved in the process.  What are Natural Consequences and when are they appropriate to apply? What are Logical Consequences and when are they appropriate to apply? Why do Natural and Logical Consequences facilitate children’s inner discipline? Discuss the three qualities that must be present for Logical Consequences to be authentic and not feel like punishment to the child?  How do Natural and Logical Consequences differ from using Punishment with children? What are the pros and cons of using Punishment? What are the pros and cons of using Natural and Logical Consequences?  What is the basis of children’s misbehavior? Revisit Maslow’s Hierarchy of Needs chart (p. 75) and at each level discuss what type of misbehavior might be observed when this need is frustrated. For example, when the Physiological Need is not met, the child may become cranky and uncooperative until the need is met.  Discuss the difference between children’s Needs and Wants. What are the consequences when a child is given what he/she needs? What are the consequences when a child is given almost anything he/she wants?  Using the metaphor of the Native American Medicine Wheel discuss the difference between the Natural Path and the Rocky Path as it relates to our being able to understand children’s behavior. What does it mean to transform our stumbling blocks into stepping stones? How does changing parents behavior have an effect on how children change their behavior? o What we can do to transform our behavior so that we move from the Rocky Path to the Natural Path in each of the following areas.